I am currently pursuing my EdD in Orgnaizational Leadership at Grand Canyon University. Want to know why I have attacked this challenge? 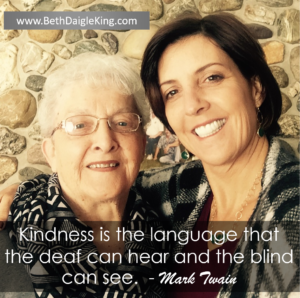 I see a need for kindness and collaboration in understanding and celebrating deaf culture and also advocating for their needs and an education they are worthy of which will benefit our whole society. The PhD education will increase my network, sharpen my focus and lifelong learning, and give greater weight to my voice. There has been two previous periods in my life where I have sought to attain a Doctoral Degree in Education. After completing research and publishing articles in Scotland, pertaining to Deaf Culture, Rights of the Deaf, Bilingual and Bicultural education of the Deaf, I requested admission and advice from the University of Hawaii Linguistics Doctoral program. Being only 27 years old at the time, I was encouraged by the Head of that division to seek experience and employment prior to starting a EdD endeavor. Having it been the early 1990’s, most professionals had not perceived American Sign Language as a recognized whole language to be compared equally to printed or spoken English, and thus my focus was not necessarily favored by this department. Five years passed, and Dr. Judy Coryell of Kapiolani Community College on Oahu, approached me with her recommendation that I seek an EdD in Exceptionalities, for the State of Hawaii, was in need of a teacher of my caliber to train other Teachers of the Deaf at the University Level. At this time, I had given various presentations at the Hawaii School for the Deaf in regards to academic and social achievement of Deaf youths through the Bilingual Bicultural approach and documented intensive parent involvement in ASL acquisition as key to student language success. Although enticed to begin the EdD endeavor, I had a small family of my own, three pre-school children at home; hence, the time demands to attend weekly courses by flying to Oahu from Maui was simply unimaginable. Recently, I was approached again to consider gaining Doctoral status. Having actively worked with Senator Ing, Senator Roz Baker and the Aloha State Association of the Deaf to pass three new laws in Hawaii addressing equal access to language, I met Dr. Angel Ramos, the new acting Principal of the Hawaii School for the Deaf. Within a few weeks of meeting him on the picket line at the State Capital, he and I collaborated to offer an hour long informative presentation to the Maui District Administration & Maui High Faculty, Parents, and members of Maui Deaf Community regarding least restrictive environmental issues and opportunities for the continuum of placement for Maui’s Deaf youths. After this presentation, Dr Ramos strongly encouraged that I seek my Doctorate’s degree. He informed me that he and I have the passion, knowledge and desire to change a system and lead an international Deaf Educational Training program, pending my Doctoral Degree. It is my intention to achieve this degree by 2020. I am an intuitive organizational team leader. I’ve been active in many non-profit organizations and I wish to bring the status of the Hawaii Deaf community’s needs to a larger scale in order to reap the funding and support to improve the social, academic and employment opportunities provided in the Islands of Hawaii. In addition, and as the opportunity arises, I envision that I will be employed by the University of Hawaii to offer international ‘Teacher of the Deaf Training’ seminars and/or develop protocol to assure positive exposure to current data that guides global leaders to improve the lives of Deaf people worldwide. I intend to bring my life’s passion to the international Deaf community. Currently I am on sabbatical from my job as Teacher of the Deaf at Maui High School. I have returned to my childhood town, Fort Kent, Maine, in order to care for my father’s aging needs. My own children are successfully independent enough to allow me this time to pursue my own goals. My husband has always supported my educational goals, and realizes that the timing and financial support to achieve this lifelong goal seems extremely appropriate at this time, and over the next 4 years. I am working as a substitute teacher in Fort Kent, Maine. Winter is approaching and I anticipate plenty of time to focus on the EdD curriculum. I’ve received an Educational Interpreters certification via an online program out of Colorado in years past, and thus, I’m familiar with the protocol of this type of online learning environment. By 2020, my eldest son who attends Rochester Institute of Technology, my youngest son who is a Freshman in High school and I should all be celebrating the diploma’s to which we seek. In closing, thank you for considering my application to Grand Canyon University this September 2016.